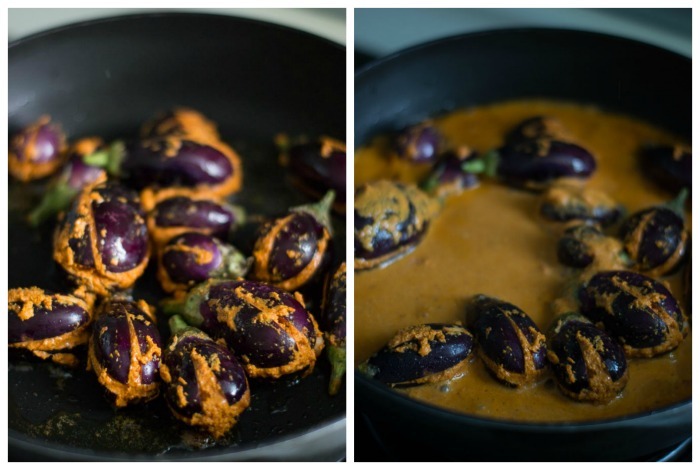 Brinjals cooked in a spicy masala – Tamilnadu style. 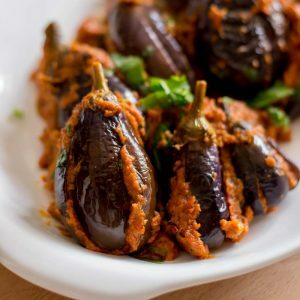 Spicy Ennai Kathirikkai Masala Recipe – Stuffed Brinjals Masala. This is one of my favorite ways of having brinjal for lunch. I love stuffed brinjals. 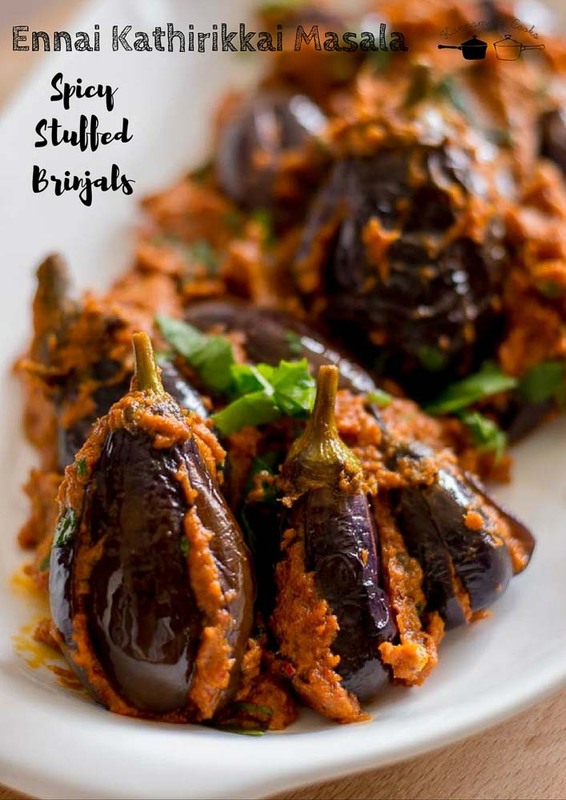 I have already shared the recipe for Andhra style stuffed brinjals which is another quick and easy recipe. This is Tamilnadu style stuffed brinjal masala. Take a pan and add in the peanut oil. Add in the sesame seeds, peanuts and chana dal. Saute on a low flame until the chana dal is slightly golden in colour. Add in the coconut, onion and the tamarind. Add in the dried red chillies. Fry for a minute. Remove from heat and set aside to cool. I added two varieties of red chillies. Byadagi and regular guntur chillies. 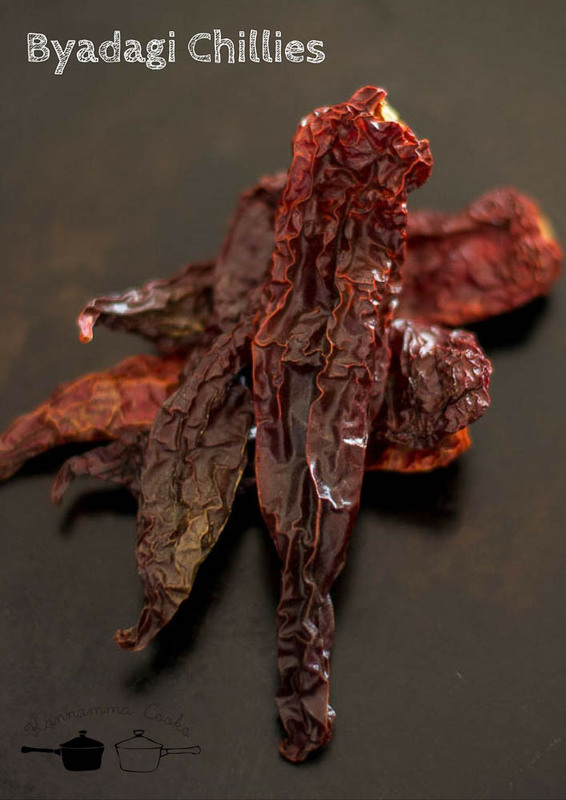 Byadagi chillies give a bright red colour to the curry and the guntur chillies makes it spicy. 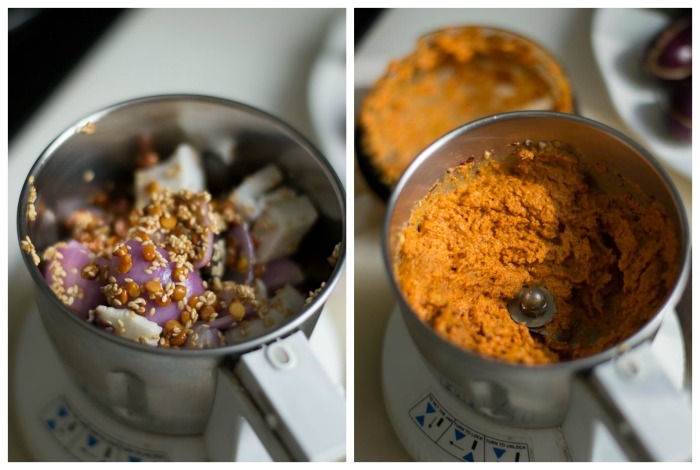 Once the mixture is cool, grind in a small mixie jar to a smooth paste. Add very little water (a couple of tablespoons) and the salt while grinding. We need a thick paste. Remove 3/4th of the stem from the brinjal. 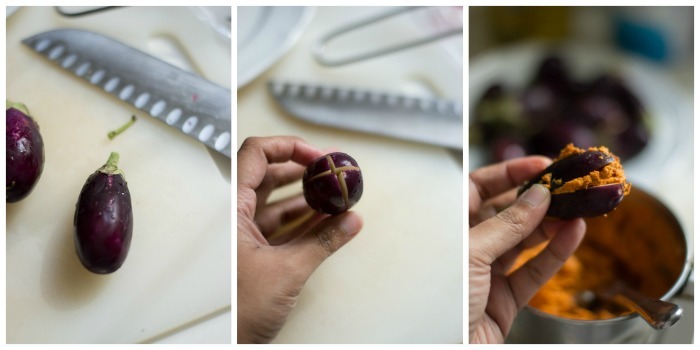 Cut the brinjal in a cross like shown in the picture. Cut only 3/4th of the brinjal in a cross so the brinjal still holds its shape. Stuff the brinjal on the inside with the ground paste. Set aside. Heat oil in a pan and add in the stuffed brinjal. Add a cup of water to the remaining ground masala paste to dilute the paste. Add the remaining paste to the pan. Cover the pan with a lid and cook on a low flame for 20 minutes. Streaks of oil will start floating on the surface after the masala has thickened from cooking. That’s an indication that the masala is well cooked. Add in the curry leaves and the chopped coriander leaves. Mix once and remove from heat. Serve hot with steaming hot rice and ghee. Brinjals cooked in a spicy masala - Tamilnadu style. 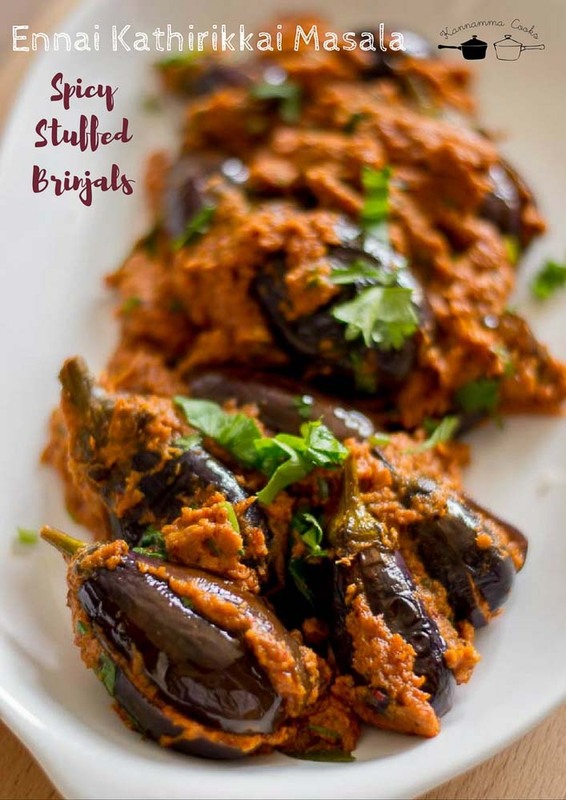 Spicy Ennai Kathirikkai Masala Recipe - Stuffed Brinjals Masala. With step by step pictures. Heat a pan and add in the peanut oil. Add in the sesame seeds, peanuts and chana dal. Saute on a low flame until the chana dal is slightly golden in colour. Add in the coconut, onion and the tamarind. Add in the dried red chillies. Fry for a minute. Once cool, grind in a small mixie jar to a smooth paste. Add very little water (a couple of tablespoons) and the salt while grinding. Remove ¾th of the stem from the brinjal. Cut the brinjal in a cross. Stuff the brinjal on the inside with the ground paste. Set aside. Heat oil in a pan and add in the stuffed brinjal. Add a cup of water to the remaining ground masala paste to dilute the paste. Add the remaining paste to the pan. Cover the pan with a lid and cook on a low flame for 20 minutes. Add in the curry leaves and the chopped coriander leaves. Mix once and remove from heat. I am a beginner in cooking and i know that i can count on your recipes for taste and have been wanting to try all of your recipes. Thanks to you, I have been able to cook tasty! As for this recipe, just wanted to know when I should be adding the salt ? Hi Mary, I have updated the post. Thanks for mentioning! Tried this day the recipe. Good. But brinjals didn’t absorb salt. Hi Robert, Try marinating the brinjals sometime next time. Suguna, Stuffed brinjal was awesome. This dish goes well with everything 🙂 Thanks for publishing the recipe. Thank you so much for trying the recipe. Glad you liked it. Happy cooking. I love your blog. You have such interesting recipes. I have been trying them out whenever a craving for South Indian food hits. They have all been delicious. The one pot one shot cooking technique has been a lot of fun to execute. I even made one or two of your other recipes using this technique and they turned out delicious. And when I don’t have the time to make something in my kitchen I check your blog to live vicariously through you! Your family is very lucky indeed. Thanks for updating so often.